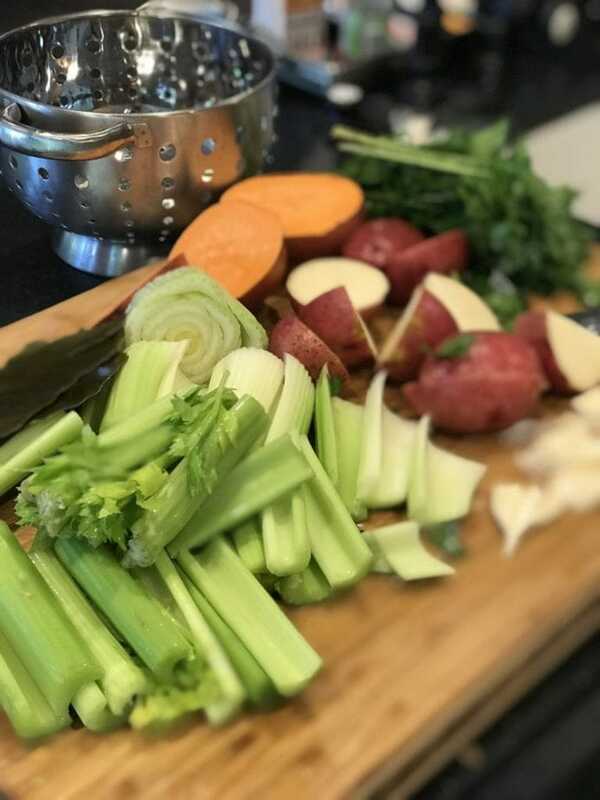 Loaded with vitamins, minerals and antioxidants; this homemade vegetable broth is an immune boosting, sickness fighting, anti-inflammatory powerhouse! And it tastes great too! 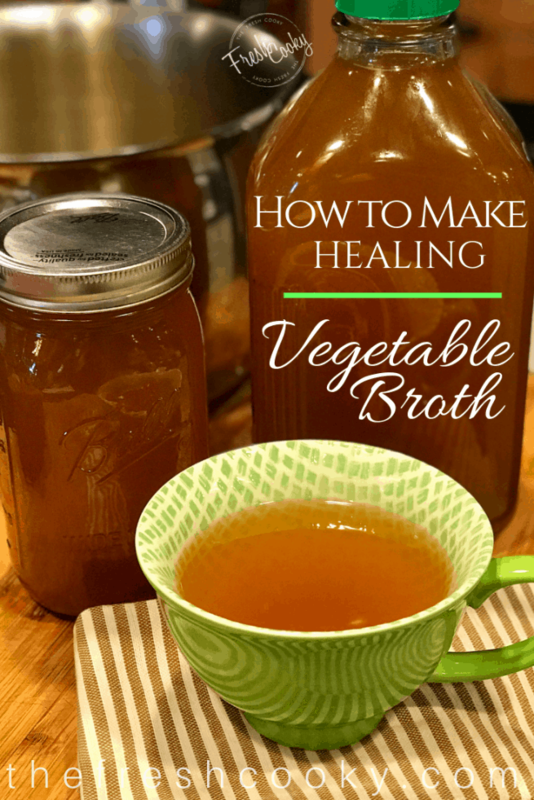 A friend of mine introduced me to this amazing, healing broth and I’m so glad that she did! She discovered it when her husband was diagnosed with cancer (thankfully, caught very early). It was recommended to take along with his treatment, to help boost his immune system and fight the cancer. 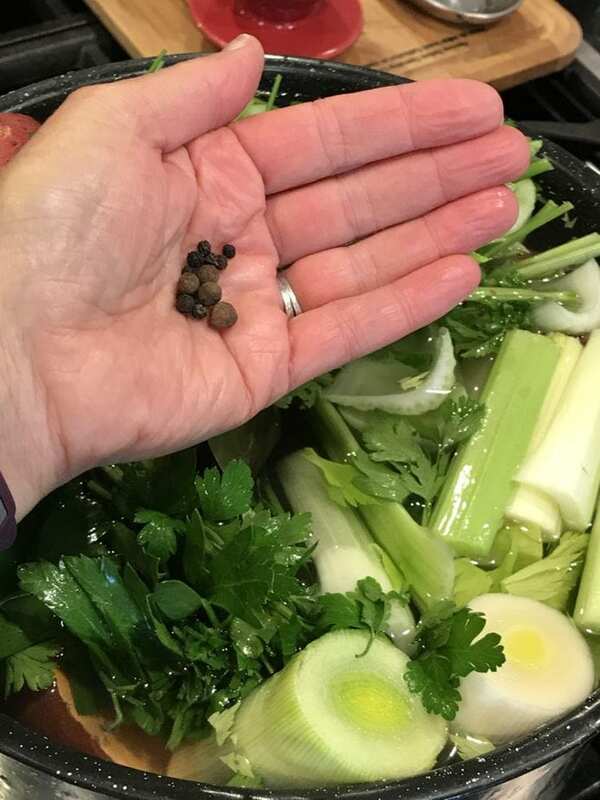 She was diligent in making this amazing or “Magic” mineral broth and thank the Lord, he is now cancer free! 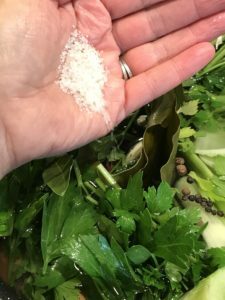 Anyhoo, she turned me onto the gal who created this Magic Mineral Broth, Rebecca Katz; if you haven’t heard about her, you are in for a treat, she is so spunky and fun, I highly recommend reading her blog. Here is what she says about this amazing broth and it is really amazing! 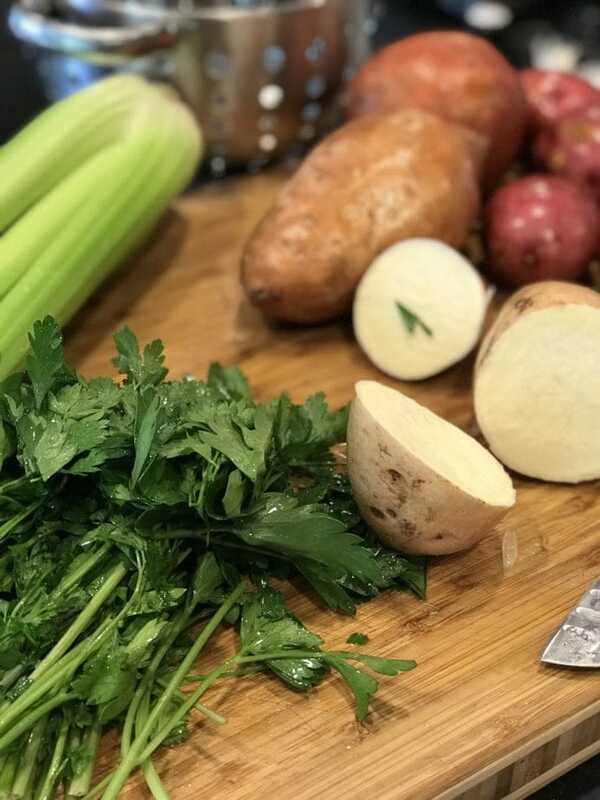 Check out her blog and her delightful recent post on Culinary Choreography, it’s fun and educational! 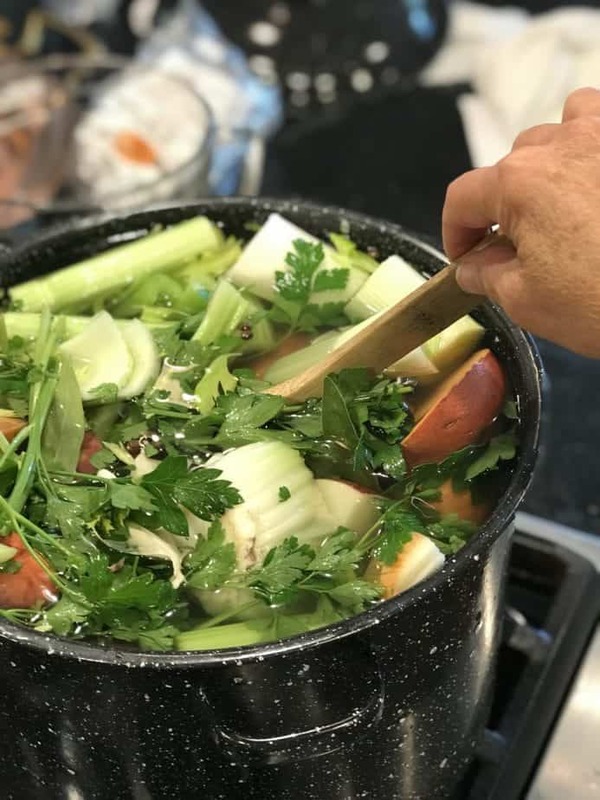 This is a fabulous broth to keep around to sip on, especially if you are not feeling well; it’s mild, pleasant, easy on the system and does amazing things for your body; chock-full of magnesium, potassium, and sodium (the good kind), it allows the body to refresh and restore itself. Good for regularity too! The easiest thing about this broth is that you don’t need to peel anything, just wash, rough chop and go! 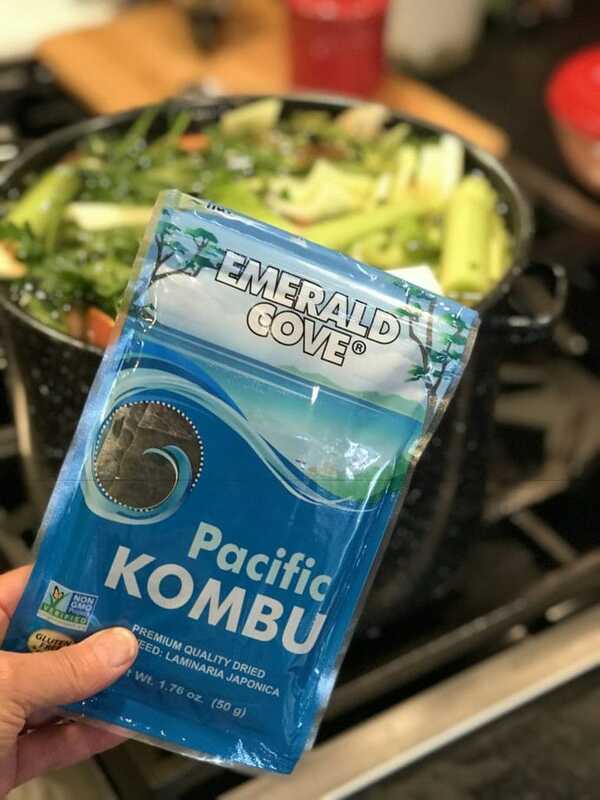 Get quality ingredients and don’t freak out about the seaweed, it’s the “magic” ingredient that imparts so many amazing vitamins and minerals and you cannot taste it! 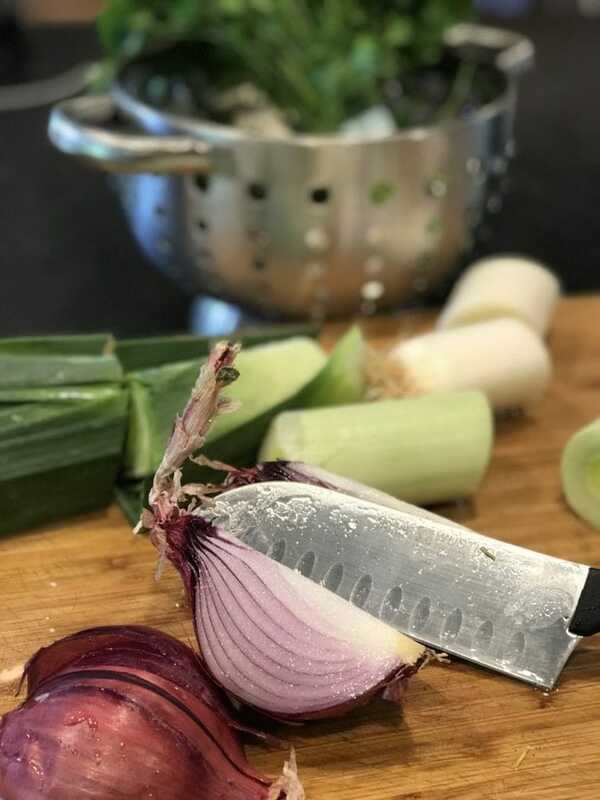 Start by washing and then quartering your onions and leeks, be sure to wash the leeks extra well! They tend to be pretty sandy! Leave your skins on! Wash and rough chop your carrots and toss them in a large stock pot (at least 12 qts), I show water here, but I think it’s actually easier to fit to the top with water once you have finished all of your veggies. Next in; your flat leaf parsley and japanese yam, do this in whatever order you want! And then your celery (heart, leaves, end; all parts) and the rest of your potatoes. 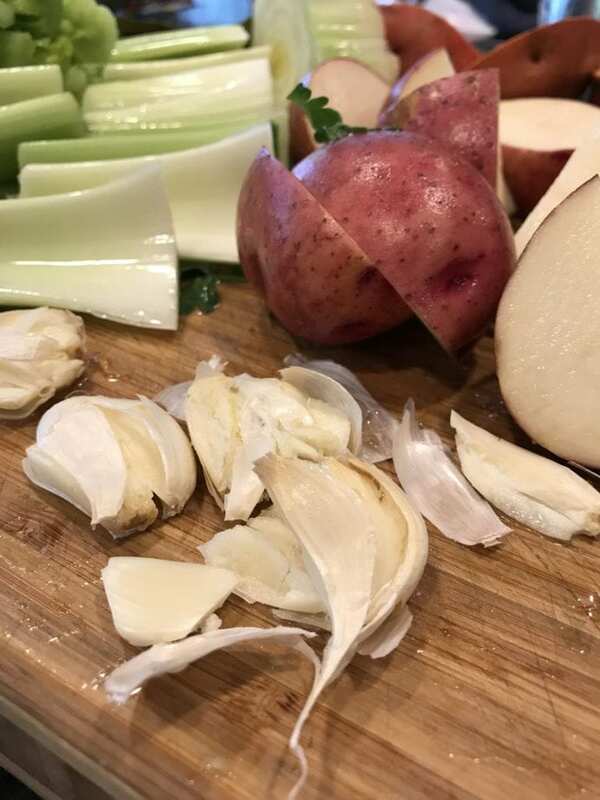 Add your garlic cloves, smooshed with the flat side of a large knife…or halved. Skins and all! And then add your Kombu* (be sure to rinse this as well). You may have to go to a specialty store for this, but don’t leave it out, it’s the magic ingredient and as I said earlier, you cannot taste it. 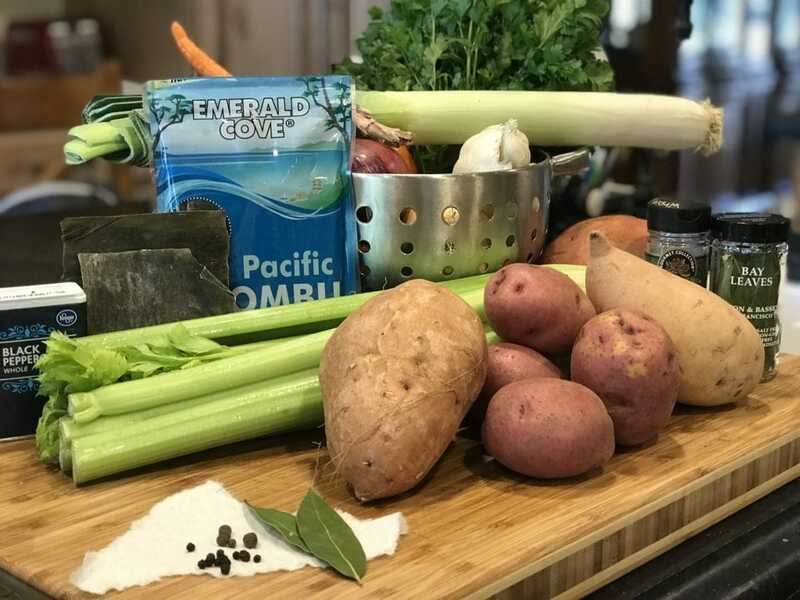 I found mine at Whole Foods and there is plenty in a package enough to last you several pots worth of this wonderful vegetable broth, but you can also buy online from Amazon Pacific Kombu. Next add your spices…peppercorns, allspice, bay leaves and sea salt. Next if you haven’t already added your water, fill to about 1″ to the top of the pot. Give it all a good stir! Cover and allow to come to a boil, then remove the lid and reduce the heat to low and simmer, uncovered for 2-4 hours. Below is what it looked like after 2 hours. Continue simmering until the broth is a rich color and you can taste the vegetables in the broth. 4 hours worked best for me. Strain broth using a large, coarse mesh sieve, making sure you have a heat-resistant container below the sieve to catch all of that great broth. Salt to taste and allow to cool to room temperature prior to refrigerating or freezing! Ladle into glass jars or bottles, fill only to the top of the shoulder to allow for expansion in the freezer or freeze in freezer baggies, removing as much air as possible before freezing. 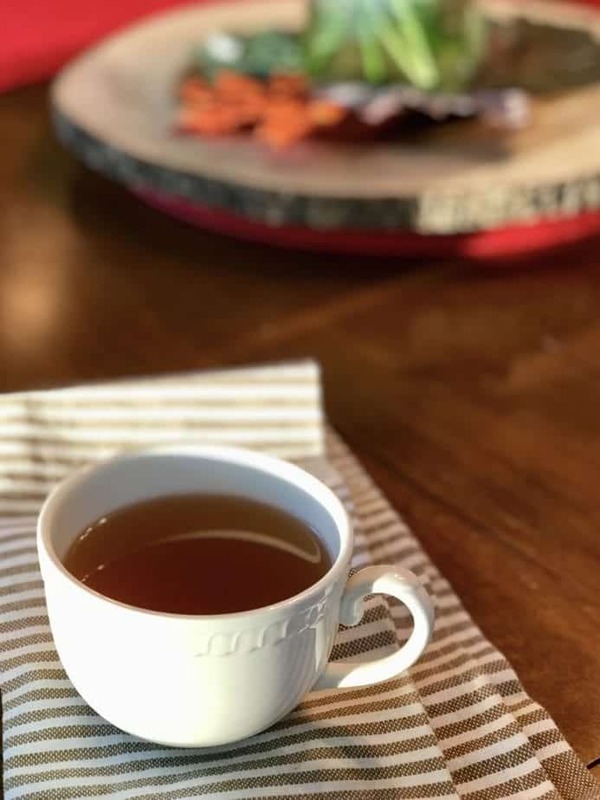 Before it cools down too much, ladle yourself a mug full and enjoy the rich taste. Store in the refrigerator for up to 7 days, tightly covered, or may be frozen up to 4 months. May freeze in quart sized jars (see detailed instructions on freezing in glass in my Beef Bone Broth recipe) and be sure to allow to cool completely before freezing or pour into gallon sized baggies, squeeze out all of the air and freeze flat to allow for more room in your freezer. Thaw in fridge overnight; sip it, use in soups, stews or anywhere vegetable broth is called for. 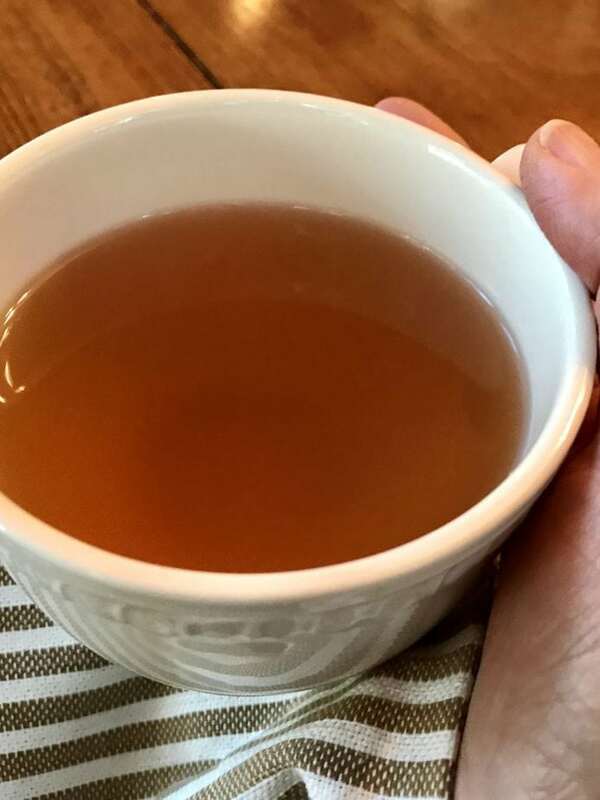 Looks like a nice rich cup of tea, the color of the broth will vary depending on your veggies, especially your sweet potatoes and yams, as long as you have plenty of flavor from the broth, it will have all of the benefits! Like this recipe, try these other two immune boosting, cold and flu fighting recipes. Delicious, nutritious, immune-boosting, vitamin and mineral rich broth! Perfect to sip, use in soups, stews or anywhere you use veggie broth. Wash all vegetables well, including the kombu. 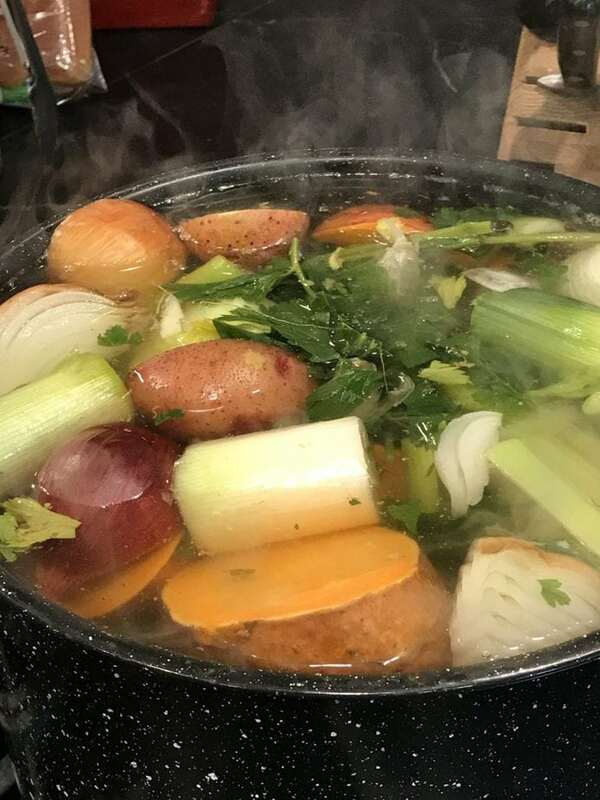 In a 12 quart or larger stockpot or soup pot, toss in carrots, onions, leek, celery, potatoes, sweet potatoes, yam, garlic, parsley, comb, peppercorns, allspice, and bay leaves. Add water to the pot within about 1-2 inches from the top. Remove lid, turn down to low and simmer for 2-4 hours, preferably 4 hours. As it simmers some of the water will evaporate, if the veggies start showing, add a bit more water. 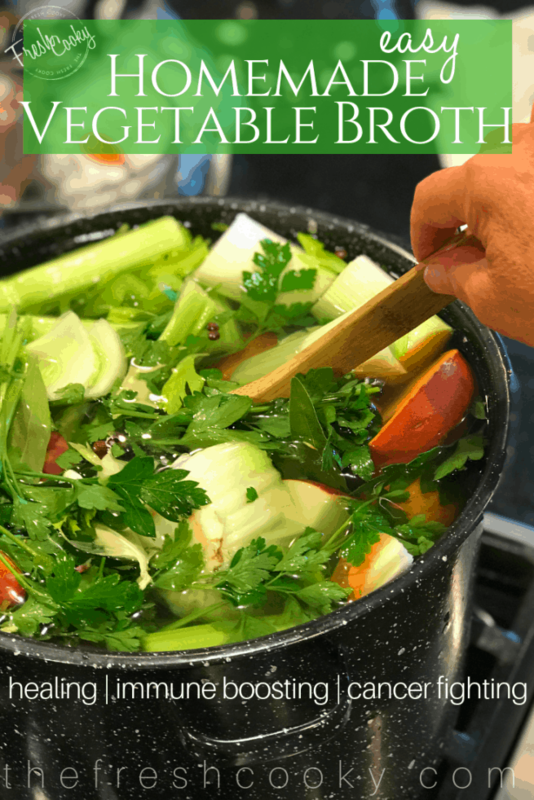 Simmer until you can taste the richness of the veggies in the broth. Pour the broth through a strainer, make sure you have a pot or bowl beneath to catch all the broth. Cool completely, then store in quart size son jars or gallon sized freezer bags. Will keep in fridge 5-7 days. If freezing in glass, fill only to shoulders of jar, leave lid off or loose and leave space between jars until frozen, or wrap a tea towel in between jars to cushion. If freezing in gallon sized baggie, fill and remove as much air as possible, freeze laying flat in freezer. 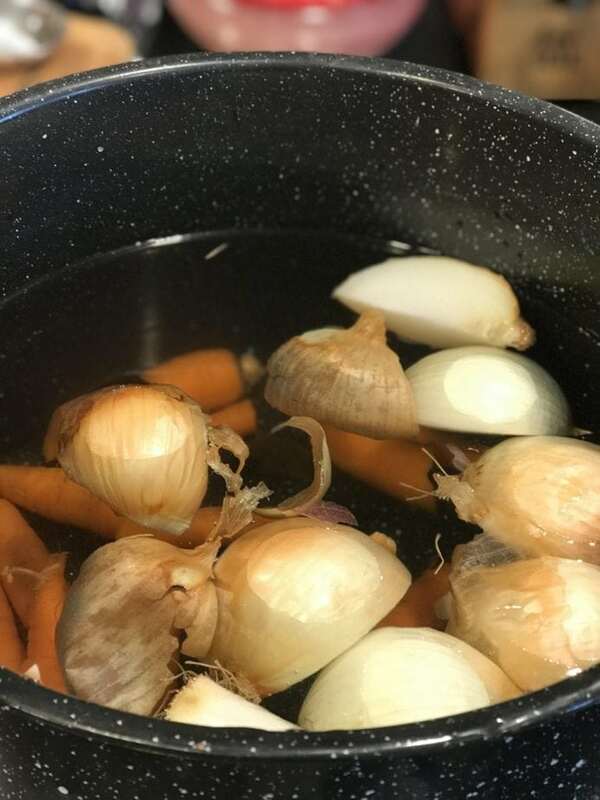 Consume within about 4 months, thaw in refrigerator and use in soups, stews and any where else you would use a veggie broth, but mostly warm up a cup and enjoy! 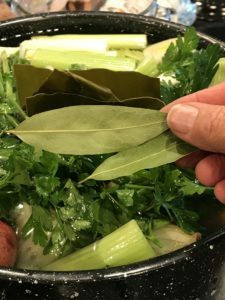 Copyright 2017 | This recipe for Homemade Vegetable Broth was featured first on The Fresh Cooky. Adapted from Magic Mineral Broth by Rebecca Katz.